One of the quintessential gifts to get your best friend is a nice piece of jewelry. 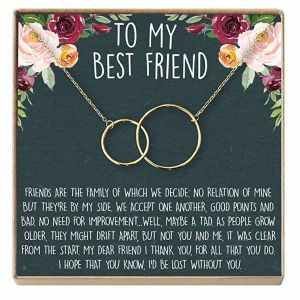 Best friend necklaces are incredibly popular because they are easy to find, affordable, and a cute way to show your best friend how much you care about them. We’ve found 10 different necklaces for you to consider that your best friend will love! Is your best friend moving away for work or school? Perhaps you’ve moved and left them behind in your hometown. It’s important to remind each other that no matter the distance, you will always keep in contact and be best friends forever. The Side by Side or Miles Apart necklace has plenty of symbolism. 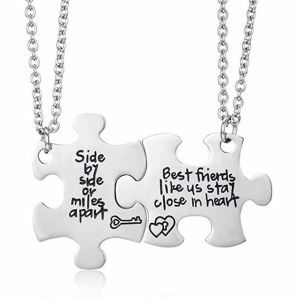 It’s two puzzle pieces that meet together, the first piece states “Side by Side or Miles Apart” and the second reads, “Best friends like us stay close in heart”. Both necklaces are made out of stainless steel, so you won’t have to worry about rusting or tarnishing. Additionally, the chains are adjustable from 18 to 20 inches, so you can guarantee it will fit both you and your best friend perfectly. If you’re looking for a more traditional option, you’ll appreciate the Rhinestone necklace. It comes with three pieces that when put together form the shape of a heart. Each piece either reads “Best”, “Friends”, or “Forever. It’s the perfect option for someone who has more than one BFF! The necklace comes with a 20.5-inch chain and is made from silver alloy. The added benefit is the beautiful rhinestone attached to each piece of the necklace which is what really sets it apart. What better way to describe your relationship other than weird? You can guarantee you and your best friend have had some amazing memories that others would classify as strange. 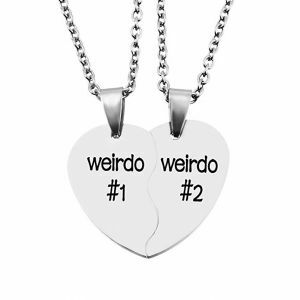 Why not celebrate your relationship with the Split Heart “Weirdo” BFF Necklace? There are multiple color options that you can choose from ranging from stainless steel to black metal and each half of the heart reads either “Weido #1” or “Weirdo #2”. It’s a delicate piece of jewelry that will make you both laugh every time you look at it. If you’re in the market for a more luxurious gift for your best friend, we highly recommend the Dear Ava BFF Necklace. It doesn’t come in a pack of two, but you can easily purchase a second one for yourself. Available in gold-plated brass, bronze, and rose gold-plated metals, you’ll be able to find the perfect style for your best friend. It’s beautifully packaged in a stunning box that has a beautiful paragraph about the importance of friendship. We especially like the design of the necklace, as it features a small and medium-sized circle entwined. Much like the necklace, your friendship is bound forever. 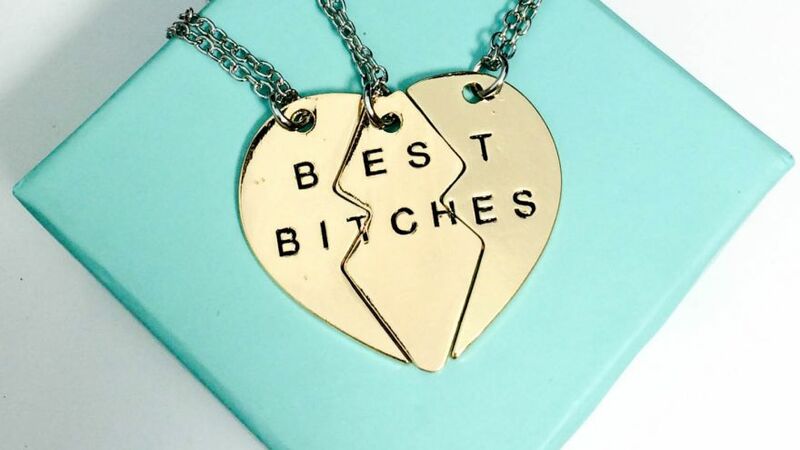 This necklace is another fantastic option for best friends who are moving away from each other. It can also be a preferable option if you’re looking for something with more than one pendant. 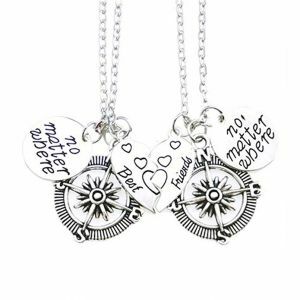 The “No Matter Where” Cnecklaces features a dainty compass, half of a heart, and a pendant that reads, “No Matter Where”. The necklace is made entirely out of stainless steel to prevent rusting and tarnishing and the chain is adjustable up to 20 inches. 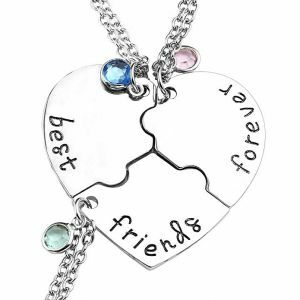 It’s the type of necklace that you’ll be able to wear all of the time to remind you of the great memories you have with your best friend. For many people, it’s hard to choose just one person to be your best friend. In fact, it’s likely you could have multiple people that you turn to during a personal meltdown! The Rhinestone Pizza necklaces are a fantastic idea, as there are six separate necklaces included in the package. Each necklace comes with its own beautiful rhinestone pendant and the pizza slice pendants fit together to create an entire pizza. It’s a fantastic way to commemorate your favorite food and your relationship with each other. Additionally, the necklaces come in grey velveteen pouches, so it’s already wrapped when it arrives. Handmade from environmentally protected alloy, it’s hypoallergenic, and the chain is 20 inches in length. At times, your friendship can feel more like a sisterhood and those are the relationships you don’t ever want to lose. 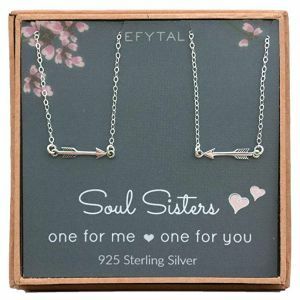 The EFYTAL set is our favorite BFF necklace set on this list as it’s modern, dainty, and will match any outfit that you wear. Each necklace features a beautiful arrow to signify your eternal bond with your best friend. The chain and pendant are made out of sterling silver, which is hypoallergenic. Additionally, each necklace is handmade, which adds an extra special touch. 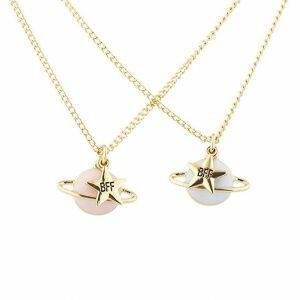 At times, it might feel like the whole world revolves around your friendship and the best way to show your BFF how much you care about them is to choose planet necklaces. Available in a set of two, each of you will receive a cute pastel colored planet with a star pendant that reads, “BFF”. The planets are blue and pink enamel and the BFF charm features a gold-tone finish. Additionally, they come with a 16” chain. 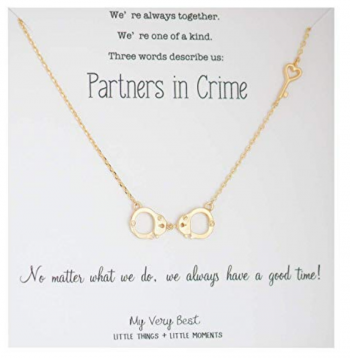 The My Very Best Partners in Crime BFF Necklace is the perfect option for friends that will stick by each other’s side no matter what. The pendant for this necklace is a pair of handcuffs, which is ideal for your partner in crime! With a 15.5 to 17.5 inch chain, it will fit anyone’s neck and it is available in gold plated brass, silver-plated brass, and rose gold plated brass. You’ll also receive an inspirational card with your order that explains the important significance of the necklace. 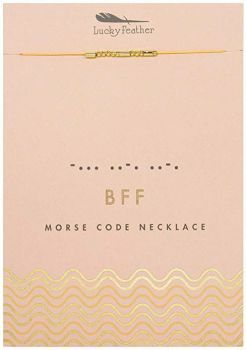 If you’re looking for a BFF necklace that is rather unique, the Lucky Feather Morse Code necklace is a fantastic option. Depending on the style you choose, the necklace features Morse code that spells out a secret message. You can choose from BFF, Blessed, Brave, Dreamer, Free, Happy, and Loved. It’s a delicate and trendy necklace made out of nickel-free materials, which is ideal for people with sensitive skin. Friendships are something to be celebrated, especially when it comes to your best friend. 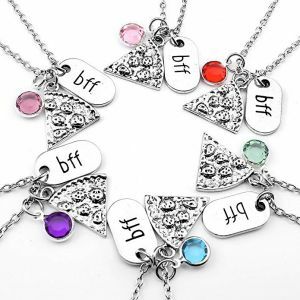 With the perfect BFF necklace, you’ll be able to give them a gift that they will remember for the rest of their life.